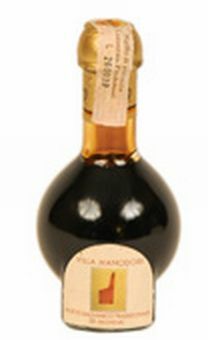 Villa Manodori Tradizionale Balsamico of Modena is Extra Vecchio Gold Seal and is submitted to the Consortium of Modena. Each Villa Manodori traditional balsamic bottle is packaged in Consortium glass. Villa Manodori traditional balsamic carries both the Consortium seal of quality and the Villa Manodori logo. Villa Manodori Extra Vecchio Gold Seal traditional balsamic is aged not less than 50 years and comes boxed with a recipe booklet.